As internet comes and goes here, I'm taking this opportunity where it's working to wish you and your family a happy and blessed New Year! Yesterday, after Mass, we celebrated the new year with our expiatory goat, or scapegoat. What is that? At the end of the Hebrew year were the high holy days, including the Day of Atonement (Yom Kippur). On that say, the high priest entered the Temple and, among other things, placed the year's sins of the Israelites on the head of a goat. This goat was led out of the city into the desert, where another man waited to take it even further out, and again, until it had disappeared. The symbols was that the sins of the Israelites were taken away. For Christians, Jesus fulfills the scapegoat: he bears all the sins of the world, and is taken outside the city where he is crucified. Going back to the scapegoat idea can help to enter more into the mystery of Christ and the sacramental life of Christians. In Ecuador, the end of the year is marked with monigotes, which are hand-made effigies symbolizing the year that is about to end. They are called "Old Year"s, and as you welcome the New Year, the Old Year is going to be gone. Traditionally tagged with some sort of "testimony" of the negativity of the past year, the monigote, or Old Year, is burned at midnight. It essentially carries with it all the negativity from the past year, and it brings to mind the crucifixion of Jesus and the "testimony" that he had placed on top of the cross: "King of the Jews". So for us, I had the idea a few years ago to make a monigote for the church: the scapegoat. It's makeshift from cardboard, newspapers, leftover wood and whatever else might be around. It has a hole in the top of it, so you can slip in pieces of paper. The way people participate is they are welcome to write on a slip of paper whatever they feel they want to be pardoned for from the year, and/or whatever they want to forgive in others. Afterwards, we all go outside and burn it. It's popular, as everyone - even the children - want to participate in writing something to put inside it. However, this year, the goat didn't want to burn, which led to some of the papers falling out (although nothing could be read thankfully), which got laughs. You can check out photos and videos here. For New Year's Eve, I was invited by the church president Ines to have dinner at her house with family and guests, so we had a great turkey dinner. For new year's, many people from the city and overseas return to Chontal (or to other rural home bases) for reunions, and so a number of houses are filled with guests and big parties. There are usually about 7 or 8 big parties simultaneously in the village, each with their own monigote, music, and activities. At midnight, people will burn their monigotes and share hugs all around with new year wishes. Then, everyone gathers from the houses and parties in a central place where there is music and dancing and drinking until the wee hours of the morning. This year, it was raining heavily all evening and night, so I didn't make it to other parties to say hello like I had in the past. Ines' parents live next door and all the family and extended family were there for funny, silly performances, and I stuck around for the comedy until a little after midnight. The rain was so heavy, it drowned out a lot of the loud music later at night, so I slept well! I'm working on plans to head out to the coast for a week, and then in the middle of January to the Amazon for a week. I'll keep posting along the way. Best wishes for a new year of God's presence and the opportunity for each of us to grow in noticing His call in our hearts. At the birthday party for Katy, one of the youth. I took a short 10-minute walk to Rio Chontal one day to relax. This frog wanted to be a "star" in the creche scene. This dog, Sacha, in Mindo fetches limes instead of tennis balls. Not the best sign. I don't think I'd want to stay in an underground guest house beneath the church. There are some heavy-duty spiders here. I write to a spider expert once in a while with photos for some feedback. These tropical wandering spiders are about 4-inches long, and would ruin your weekend if you got bit. They were both on a neighbor's property, the lighter colored once prancing around the kitchen! Not enjoying the New Year's festivities. Finally, I want to post two photos together. 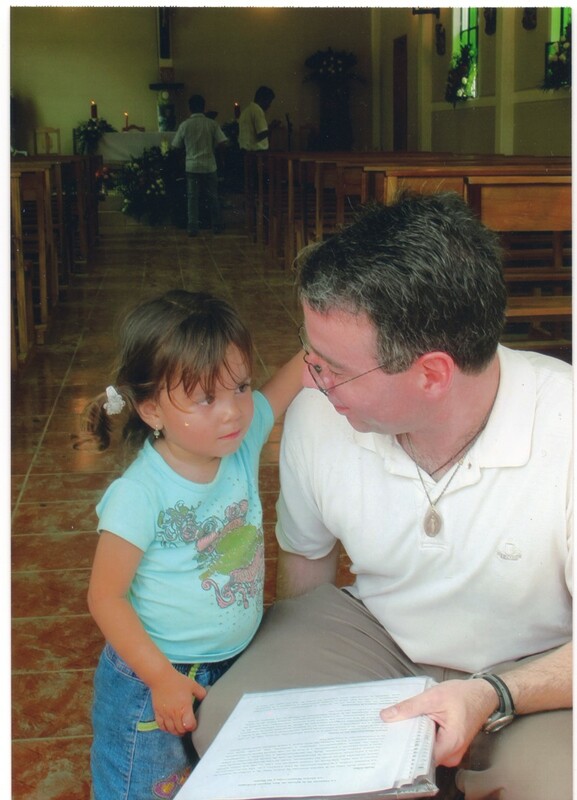 In my first visit to Chontal at the first Mass, I met Emily, who was 3 years old. She now lives in Quito and we got another photo after 7 years. Time flies!